After looking at the I/O routines I was troubled that while BYTE and STRING were covered adequately, CARD and INT were left out in the cold. The only built in routines for reading and writing CARDs and INTs are the Print and Input variants which are string based. Using them is further complicated as they need to be delimited if stored in a file. And on top of being delimited, the storage consumes more bytes than necessary for the data type. CARDs and INTs, within the value ranges supported by Action! can be stored in 2 bytes. 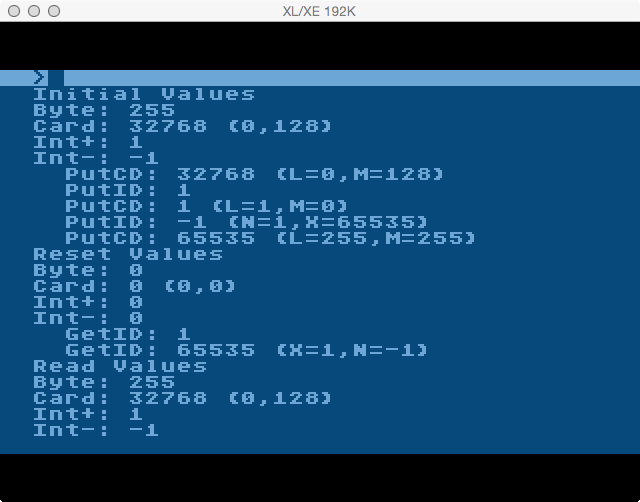 Using the Print routines a large CARD value will consume 5 bytes, and large negative INT will consume 6 bytes. That can add up to a lot of wasted space. PutCD has a dependency on PutD(). GetCD has a dependency on GetD(). Likewise PutID has a dependency on PutCD() and GetID has a dependency on GetCD(). I had some trouble getting PutCD to compute the MSB (most significant byte) of the CARD value using the division by 256 method where the MSB would not be correct within the last 213 values of the maximum CARD value. A member of AtariAge forums named fujidude offered an alternate method using bit shifting which works fine. The version presented here includes that method. The Get routines return the read value as the appropriate data type (CARD or INT). This is the source for my routines. I’m not going to break them down line by line, but instead have commented them inline. ; PutCD procedure. Puts a CARD to a device. ; and a card parameter which is the card to write. ; be stored in the byte bM. ; a byte assigns the LSB of the card to the byte. ; the MSB to the device (standard 6502 format). ; PutID procedure. Puts an INT to a device. ; and an int parameter which is the int to write. ; GetCD function. Gets a CARD from device. ; byte parameter which is the device channel to read from. ; GetID function. Gets an INT from device. ; the value is a negative number, so there is more work. ; then add 1 to it. I created a sample program to test the functions. It writes a byte value, a card value, a positive integer, and a negative integer to a file (without delimiters); resets the variables to zero; then reads them back in. It prints the values at each point they are changed (start, reset, post read). I’m not going to break down the entire program this time. It is commented enough to understand it. 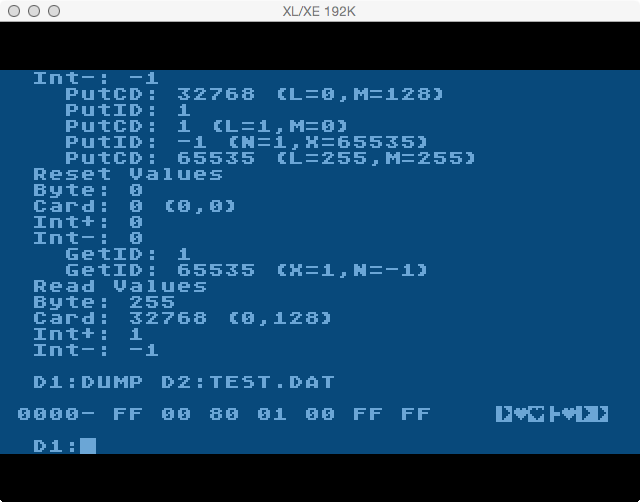 In these results, you can see some debug output (indented lines) I had in during PutCD troubleshooting that allowed me to see the values during each step of computation. The BYTE value started and ended at 255. The CARD value started and ended at 32768 with LSB of 0 and MSB of 128. The positive INT value started and ended at 1. The negative INT value started and ended at -1. I had meant for this post to be something useful, and I suppose this still is, though not what I intended. And because bit shifting has now been touched on, one of the next posts will cover that.